This attractive mushroom may be easily known by its bright colors and its clustered mode of growth. 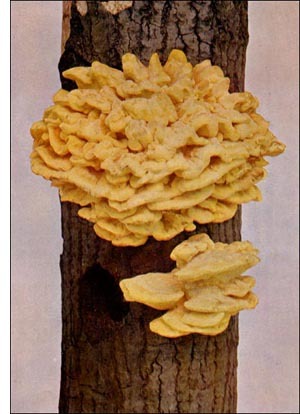 Our illustration is a faithful reproduction of beautiful specimens of the Sulphury Polyporus which grew on a living black oak tree about fifteen feet from the ground. Though the habit of this mushroom is to grow only on dead wood, the host of the two illustrated was seemingly sound throughout. When young, if cut or broken in warm weather, a yellowish juice will exude. The caps overlap each other and are frequently five inches or more in width. The flesh is white and usually not more than one-half an inch in thickness. The young cap has a yellowish-red or light orange color which fades, as growth continues, to a beautiful yellow color, especially on the margins. A large cluster of the caps of this mushroom with the bright colors and wavy margins form a beautiful picture on the dark background of a stump, a log, or a tree. It is not particular about the kind of wood on which it grows. The dead wood of almost any species of trees may serve as its host, and not infrequently it will grow upon those in an orchard. The sulphury polyporus is an excellent illustration of the fallacy of the belief that the highly colored mushrooms are all poisonous. It is not only edible, but palatable as well. However, only the young caps should be used as food, for mature specimens are not only tough, but very indigestible, and unpleasant to the taste. Thinly slicing the young caps and frying them in butter is perhaps the most satisfactory method of preparing this mushroom for the table, though it may be prepared in other ways. This species has a wide distribution. It may be found in the forests or in the orchards; on the dead wood of trees, on the lawn, or anywhere where conditions are favorable for its growth. Though it may be found from May to November, it is more common and grows more luxuriantly in wet weather.